If dunking two holes-in-one in the same round is a 67 million-to-one chance, what are the odds on two players each scoring two eagles within two weeks of each other at golf clubs on either side of Brisbane? It happened recently, and the exponents were not exactly youngsters. For 73-year-old Joe Young and 64 year-old Mike Barnes, the respective achievements were highlights of their lifelong sport. 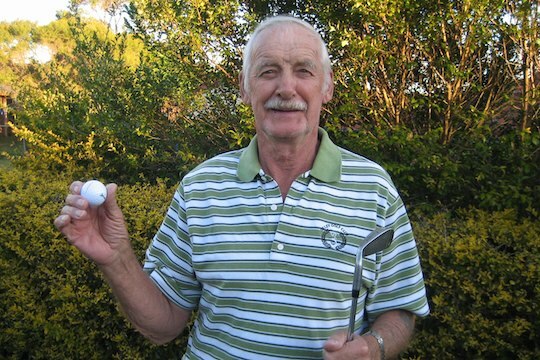 Carbrook Golf Club member Mike Barnes was the first to send historians racing for their record books when he scored eagles on the first and 14th holes at his club in a competition in late July. One eagle was a hole-in-one. He hit three-iron from the tee on the 313 metre first hole and holed out with his wedge from 80 metres. Another club member, Steve Sydenham, also eagled the first on the same day. Mike’s ace came later in the round with a six-iron in to the 160 metre 14th. Just two weeks later, and Oxley Golf Club, Joe Young aced the par-three fifth and the par-three ninth in the one round. He hit five iron to the 154 metre fifth and a mere pitching wedge to the short (123 metre) ninth. Neither are mug golfers. Joe plays off 11 and Mike six. But both have seen better days, handicap-wise. An avid golfer and scratch marker as a young man, Mike turned pro after training under Arthur Gazzard at Victoria Park Golf Club in Brisbane. He then spent time as the pro at Maryborough Golf Club, played the Queensland Troppo Tour and qualified for the Australian Open in 1966. But at 23 he not only found another career, but discarded golf completely until just on four years ago. “I probably played about 20 games in that time, mostly just social rounds,” he said. Joe, a Scot, was ‘born’ in to golf. He first started playing at Harburn Golf Club midway between Edinburgh and Glasgow and his current handicap is the first time he has been above single figures in almost 40 years. He has been a member of Oxley since he moved to Australia 30 years ago and, now-retired, play three days a week. He has had three previous aces. And Barnes has made himself a promise. He will not discard the trophy he scored for his most recent hole-in-one. And it’s not because this one is more important than his previous two, but at 64 he is not as blasé about his golfing feats as he was once as a pro golfer. “I have had two holes-in-one in another life,” said Mike, who finished as a golf professional at 23 years of age to ‘get a real job’. Mike was surprised at how quickly he rediscovered his swing after being away from the game for so long. His initial handicap on his return was 12, but within a year he was down to three. Now he is out to six but feels his touch is returning again. He has already beaten the Carbrook course with a one-under70 and had 72 the day he scored his two eagles.